Dennis M. Sweatt Comic Book Creations and Design! 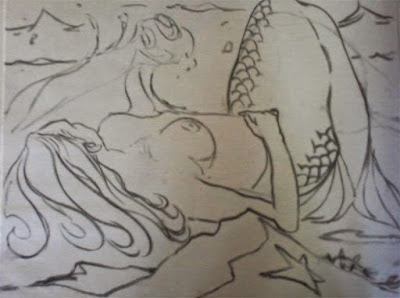 : Why Learn Gesture and Contour Drawing in School? Why Learn Gesture and Contour Drawing in School? My first art class was at 48yrs old. I've been drawing since I was six. 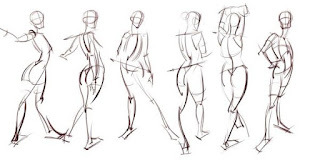 Gestures and contours make sense because they are head-to-toe visions of the body. In art class with charcoal sticks, we began with gesture lines, the model holding each pose for 30 seconds to describe movement and direction. We then made gestures for one minute with different poses. Not until we filled a newsprint sheet with multiple drawings did we begin to sketch the model. The mind-hand connection takes time even for a professional. We didn't spend excessive time on gestures and contours. They are not required for life drawing but assist in the warm-up. Art for most is flow and control in unison. Charcoal drawing from a model in art class.